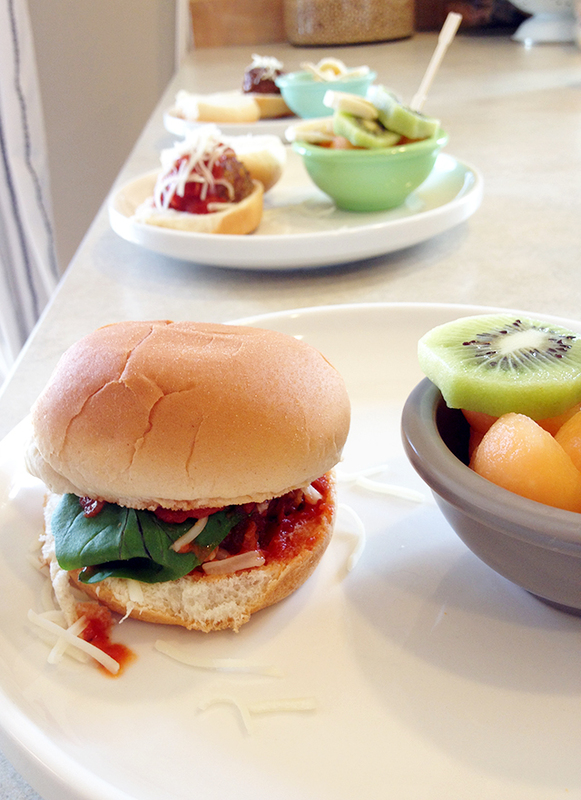 posted one of our fave dinners (meatball sliders!) on Instagram last week and thought it would be fun to share the recipe here. we love this savory and scrumptious comfort food served in a mini size! they are also simple enough to make on busy evening and light enough to eat all year round. make a double batch and serve over pasta later in the week! Preheat oven to 375 degrees and line baking sheet with parchment paper. In a medium bowl, combine corn flakes, parsley, egg, oil, 2 tablespoons marinara, 2 tablespoons cheese, salt and pepper. Add ground beef and mix together. Roll mixture into 12 meatballs, placing on prepared baking sheet as you go. Place on rack in center of oven and bake for 20 minutes, until cooked through. Set aside and let cool for 5 to 10 minutes. Place basil on bottom half of each roll, add a dollop of reserved marinara, top with a meatball, drizzle with more marinara, sprinkle with cheese and cover with roll top. Arrange on plates, serve with one or two simple sides (ideas below) and wait for the compliments to roll in!